Articulated Floor Lamp – With Yardsticks! Make a Massironi Shelf – What is a Massironi Shelf? Amazing Kids Playhouse Plans – FREE! 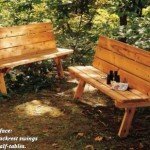 I don’t know why, but I have been fascinated with Folding Picnic Tables for quite some time. 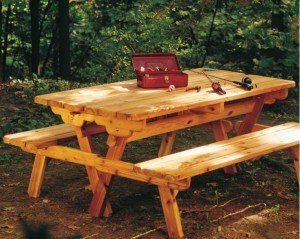 Back in the day (1998’ish) I used to sell woodworking plans online and the convertible picnic table plans was always a top 10 seller. In fact, we have another version of a folding picnic table. This table is absolutely one of the more attractive convertible picnic table plans (boy, I keep trying to spell it convertable). If you notice, the table has some very nice detail and joinery that will help it to last for years. Wood parts that have a hinge, or movement need much more consideration toward being durable. A woodworker can’t simply depend on a glue to due the job. 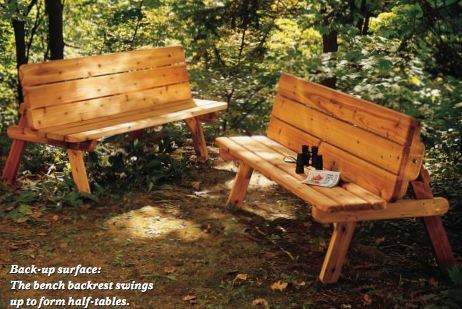 This free wood plan comes from “Cottage Life” magazine. The plan is in PDF format. Click on the image for the full plan. Click on the large image to view / download the complete PDF plan.